Welcome back to the Stamp & Scrapbook Expo blog on this beautiful fall day. Don’t you just love Saturdays? I certainly do because I get to share my passion for crafting with you. Today I want to challenge you to take an opportunity to try something new. You never know what new technique you are truly capable of unless you give it a try. I hope you will find some inspiration today, and will also find some new tips and techniques in the projects that I have to share with you. Grab a drink, sit back, relax, and enjoy! 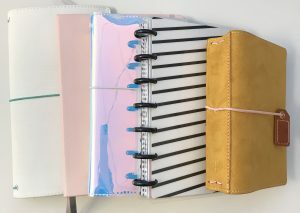 Do you have a paper that is very busy, and even though you love the design, you have an artistic block when it comes to using it? I think at times we all sit down to work on a project and our minds are completely blank on how to use the product. 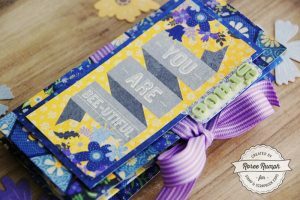 Today Missy shows us a great design of fussy cutting the paper to create her own designed layout. Look how pretty these leaves are, they look watercolored. I love the way she overlapped them to create a banner of leaves. This created a perfect place to add the photo. 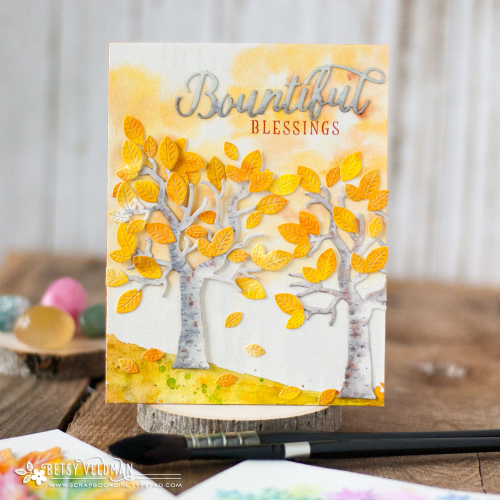 This beautiful masterpiece is created with lovely colors which gives it a sweet, warm fall flair. Missy sure has a way of making things less intimidating by getting you inspired to try new ideas. You are going to be pleasantly surprised at how easily this fabulous layout comes together. Missy used some Shimmerz Paint along with a leaf stamp, using gold ink to stamp around the page in a few places on the background. Missy adds such a balance with all the embellishments. When using leaves or flowers on a layout it is easy to pop the edges up to give it some nice dimension and keeps everything from looking flat. Click here and you find a wonderful tutorial on how to create this beautiful layout. Missy will share her tips and techniques with you as well. While you are there be sure to look at Missy’s other wonderful projects. You will leave feeling inspired and ready to create many more projects. Enjoy! Today’s project is a fun water-coloring technique using die cuts. Have you ever heard of wet-on-wet? If you have experimented with watercolors at all, this is a very easy and most fun technique to do. Simply wet your watercolor paper with plain water so that it is nice and wet, then just paint over the wet paper with your watercolor paints. You will see the color blend and mix. You can paint on your watercolor paper first then die cut it, or you can die cut first and then paint last. It all depends on the look you want to achieve. Betsy will show you some great examples of both. I want to take you on over to Paper Scissors & Superheros where you will see three different amazing cards that Betsy has created. Each has its own technique, and you’ll see the different steps that Betsy has used. You will love her techniques and her creative mind, so be sure to look around her blog at all the other fabulous projects she has created. A big hug to Betsy for sharing her talent with us. Pumpkins come in lots of different colors. You can find some that are green, yellow, red, white, blue, tan, and, of course, orange. I love to go to the pumpkin patch this time of year and look for odd shaped, different colored pumpkins. 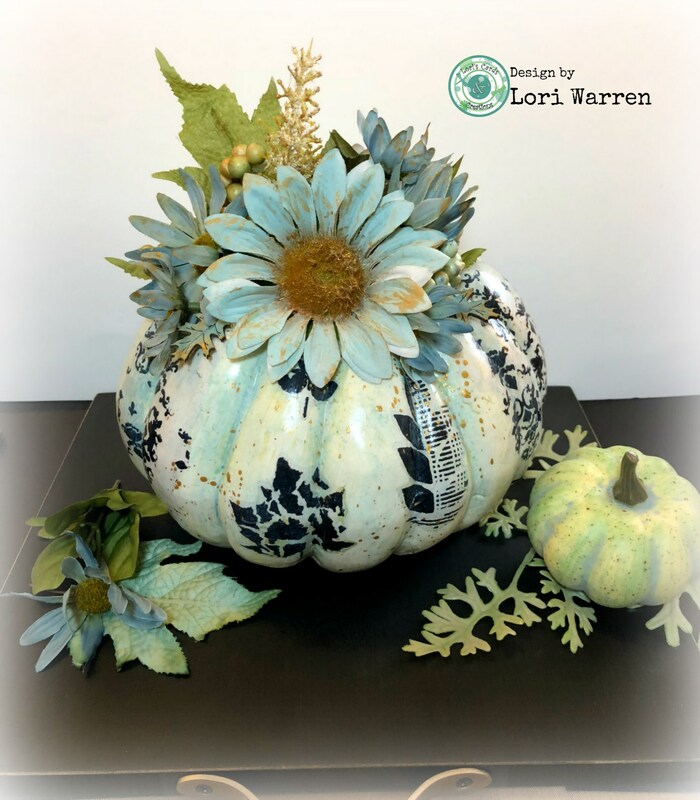 So, if you are a pumpkin lover like me then you will fall head over heels with this unique and beautiful pumpkin created by Lori Warren. This pumpkin is one that you can use for different seasons, and the compliments will continue to roll on in. One thing that I love about fall is the many colors that we see, along with many different pumpkins. I love decorating pumpkins, so when I came upon this fabulous not-traditional color scheme I knew I had to make this. These colors, paired with a white pumpkin, make for an interesting take on a fall project. 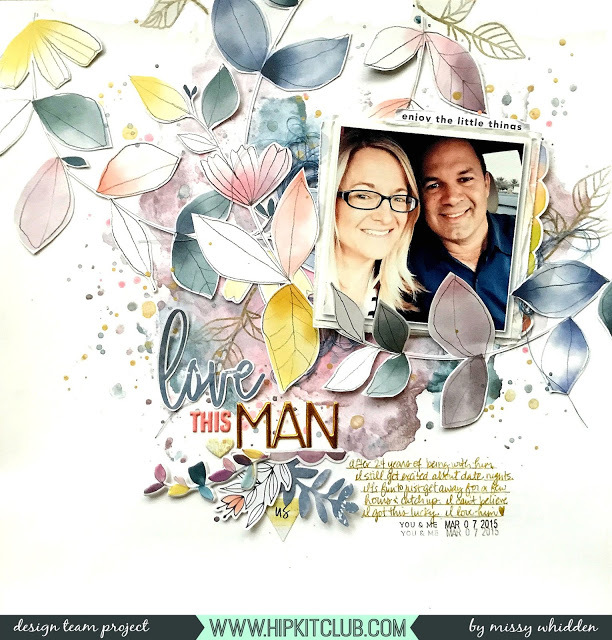 Click here and let’s pop on over to Confessions Of A Stampo’holic where you can see all the materials used plus a video by Lori. She will show you how she created this fabulous stencil on tissue method that will stretch the use of your favorite stencils. You will have so much fun creating your own uniquely colored pumpkins. Have fun creating! If you have never had a sweet apple cheesecake napoleon before you’re in for a real surprise. These lovely desserts are impressive, very easy to make, and they are absolutely delicious! This impressive recipe is surprisingly easy to put together. What a refreshing and light dessert to accompany a heavy meal. 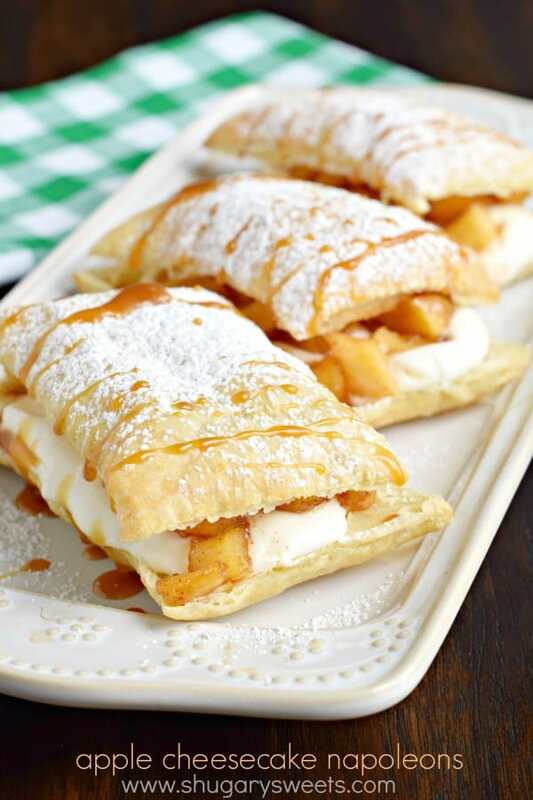 It is a delicious combination of apples, cinnamon, cheesecake, and more! Add a scoop of vanilla ice cream with a drizzle of caramel… DELISH! Who wouldn’t fall in love with this dessert? Let me take you on over to Shugary Sweets so you can write down the recipe. This will be a great fall dessert that your family and friends will want you to make over and over again. Thank you, all my crafty friends, for stopping by on your busy weekend. 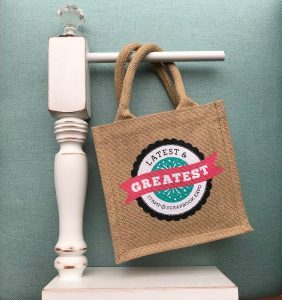 I hope you have been inspired today by these fun projects. I look forward to spending more time with you next Saturday and I will have some more fun projects to inspire you. I hope you all have a lovely weekend and I’ll see you next week. This entry was posted in At Home, Blog, Card Making, Recipes, Saturdays With LeAnn, Scrapbooking, Stamp & Scrapbook Expo, Stamping and tagged Aimee Shugarman, Apples, Betsy Veldman, Birch Tree, Caramel, Cheesecake, Cinnamon, Confessions Of A Stampo'holic, Crafters Workshop Stencils, Deco Art, die cutting, fall, Fall Dessert, Fall Florals, Hip Kit Club, Leaf Stamp, Little Nuggets Creations, Lori Warren, Missy Whidden, Paper Mache Pumpkin, Paper Scissors & Superhero, papertrey ink stamps, Pumpkins, Shimmerz Paint, Shugary Sweets, Vicki Boulton, watercoloring, Wet-On-Wet Technique.